This is a very common problem with using a sling that parents often ask me about. It certainly can be solved however there is no way to solve this without your son crying at some point. He cries, because you put him down, eventually whether it is in 1 minute or 10 minutes, you can’t stand to hear him cry so you are likely to pick him up and put him in the sling again. Just as know too well, he becomes too big and heavy and your back is breaking and you are exhausted so you reach a point that despite you wanting to carrying him it becomes physically difficult. 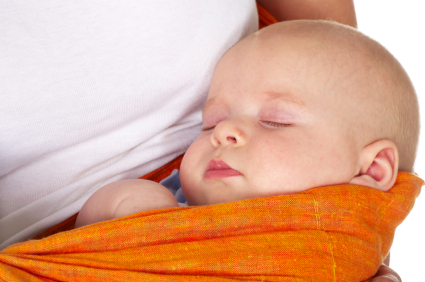 If your son sleeps during the day in the sling as well the problem becomes more difficult. At this point the part you need to change is his sleeping cues. In his brain, when he falls asleep in the sling, his brain cues in you, your warmth, your heartbeat, your voice, your smell and movement. Thus, when you take him out of the sling and ask him to sleep on his own, he gets distressed, as his brain solely believes that he cannot sleep unless he has you and all the other cues he has associated. You and I know that he can surely sleep without you and these cues provided by you however it then becomes a matter to show him that he can and he relearns these cues. Be sure to get some help with this if needed. If it is for you, just the problem of him wanting to be carried all day and not sleep as well, I suggest you start putting him on the floor, as at this age it is essential that he have about 1000 hours of crawling to be done. Sit down with him and play for 15 mins or so. At some point get up and walk away, if he protests, take no notice, when he is quiet again, come back and talk to him, or sit down again and play. After another 5 mins, get up again and do the same. You are actually starting to mix it up on him. Do the same with the sling. Put him in and after 5 mins, take him out, put him down, once he stops protesting then pick him up and put him back in, take him out etc. You get the general idea. Start mixing this up on him as well. He will protest for about 3 days then start to get use to the idea that he goes in and out of the sling regardless, so the protesting starts to fade away. If he is tired then don’t worry about the mixing up, just put him to bed as the tireder he is the less able he will be to cope. This mixing up is also best done in the morning when he is the most refreshed and copes the best. Trying this at 4pm is not a good idea! Just a final note on slings – they are so handy for carrying babies and babies love being close to you, however just be sure that they do not sleep in the sling for the majority of their sleeps, just some of them. Also be sure from a safety perspective for younger babies that you can always see their face while in a sling and that their windpipe is not quashed by their chin.